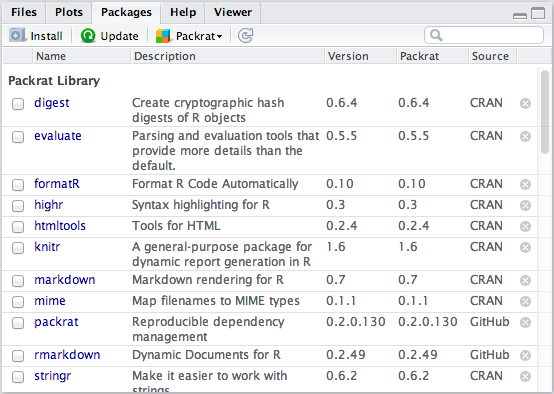 The latest version of RStudio includes built-in support for Packrat. 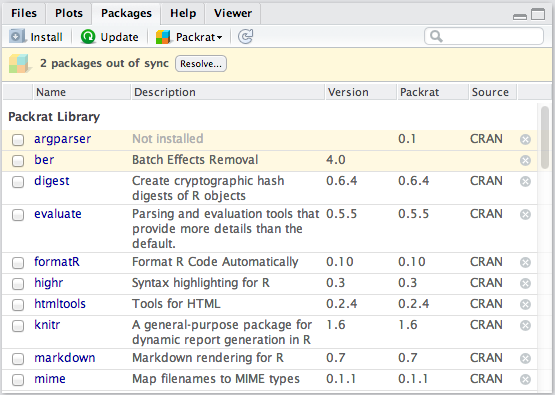 To use it, you’ll need RStudio 0.98.945 or newer, and the very latest version of Packrat from GitHub. This document presumes that you’re familiar with Packrat concepts; if you’re not, our walkthrough is a good place to get introduced. Like Packrat projects, RStudio projects are designed around a workflow in which your code and its resources are housed in a directory on disk. In a Packrat project, the Packrat “application directory” (i.e. the host for /packrat/) and RStudio “project directory” (i.e. the folder that contains the .Rproj file) are the same folder, so Packrat and RStudio both have the same understanding of a project’s contents and can work together to manage its library. The new project will come with its own private library, just as though you’d created a new directory and called packrat::init() on it. 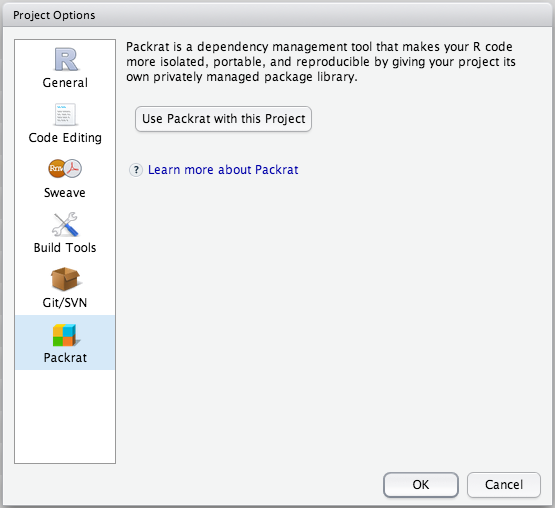 If you have an existing RStudio project you’d like to bring under Packrat control, you can add it using the new Packrat section under Tools | Project Options. 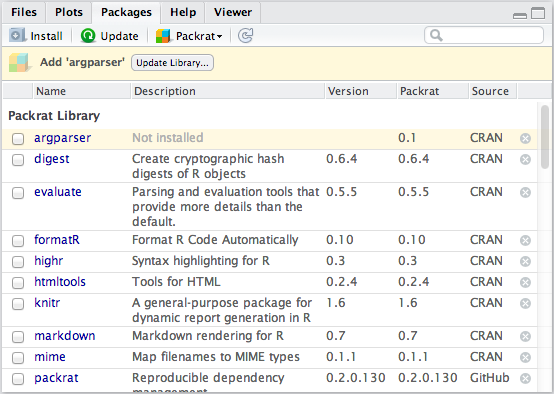 While you’ve got a Packrat project open, the Packages pane will show you the status of your project’s private Packrat library, including the stored Packrat version of each package. You can check the Packages pane any time to see what packages are available in your private library or check for differences between your private library and what Packrat knows about. 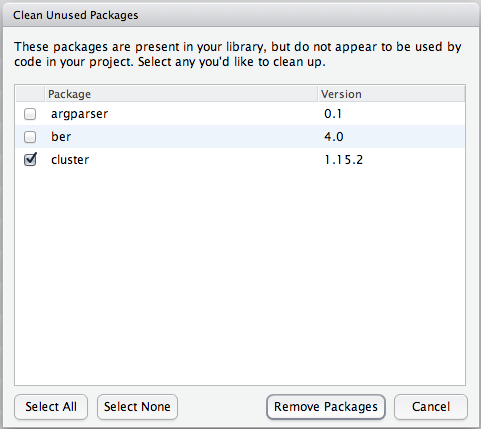 RStudio will raise the Packages pane if there’s any action you need to take. You’ll notice that when you first install a pacakge, the Packrat column is blank: this is because the package isn’t stored in Packrat yet. 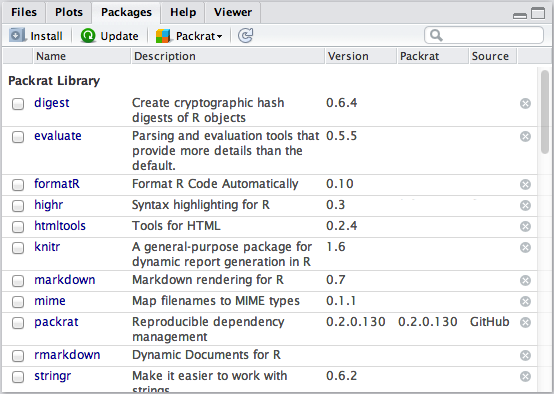 RStudio works behind the scenes to fetch the package’s sources and save them in Packrat. This feature is called auto-snapshotting. You can disable it in Packrat options if you’d rather always save library changes manually. 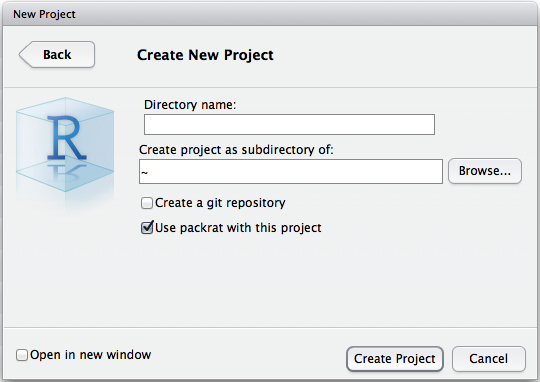 If you’re collaborating using a version control system, Packrat will help keep your private libraries in sync. 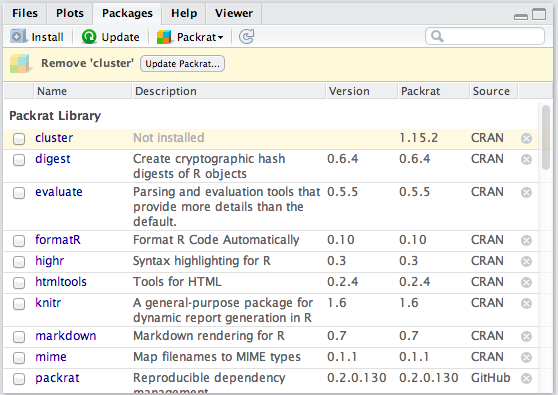 RStudio watches for changes to your Packrat lockfile. When a change from a version control system updates your Packrat lockfile, RStudio will prompt you to apply that change to your private library. For instance, let’s say your collaborator adds a package called argparser as part of a commit. When the packrat.lock file is updated by the version control system, RStudio will prompt you to bring your library in sync. When your library differs from Packrat, RStudio will try to guess the appropriate action to bring them back in sync. Notice that in the two cases we just covered, the states were identical: a package is present in Packrat, but not the library. RStudio tries to infer whether the appropriate action is a snapshot (i.e. update Packrat to match the library) or restore (i.e. 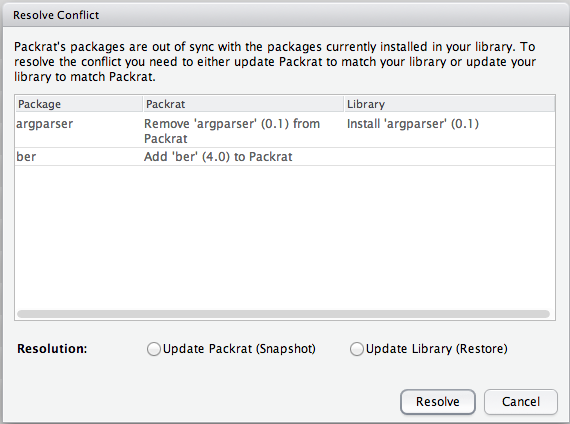 update the library to match Packrat). In some cases, however, it won’t be possible for RStudio to guess. Let’s imagine that you ignored your colleague’s changes and added a package of your own, ber. This will generate a conflict. It’s not possible to cherry-pick changes–you can pick your library state or the Packrat state, but not some of each. It is presumed that your library state and Packrat state each represent a consistent state, and cherry-picking changes from each could leave your library in an inconsistent state. Package libraries can grow over time to include many packages that were needed at one time but are no longer used. You can clean these up with the Clean Unused Packages command. This brings up a dialog that with a convenient interface over packrat::clean(). Remember, package removes aren’t auto-snapshotted, so save your changes to Packrat once you’ve verified that your project’s state is consistent after cleanup. Packrat’s understanding of which packages you’re using is based on some relatively simple heuristics, so it might not always be able to figure out that you’re using a package. If you want to keep a package from appearing in the unused list, just add a library(packagename) call to any .R file in your project’s directory.